Viper Serve-over Counters are available as both Ambient and Refrigerated Counter Units. Sizes 1300, 1600 and 1900mm long with a depth of 950mm and height of 1250mm. Unit can be manufactured in a wide range of colours to suit your decor and aluminium frames can be anodised either silver or gold. Ambient units have 1 or 2 shelf levels with lighting to top only. All have hinged curved glass fronts. 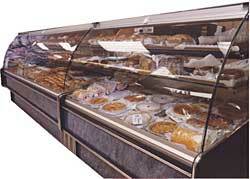 Refrigerated units have under storage refrigeration with 1 or 2 shelf levels and lighting to top only. All have hinged curved glass fronts. Till units and inner and outer counter units available in matching designs. 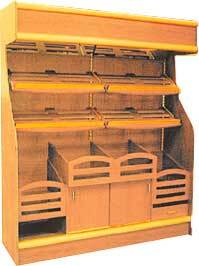 Bakery Wall Display Units are available in a range of designs, laminated in wood colours to suit your decor. Specials made to order.